The prevailing unhealthy food habits and hectic lifestyle of consumers across the world are the primary drivers of the global migraine drugs market. Further, the growing population and increasing awareness among consumers regarding the availability of the migraine treatment drugs are prominent factors fueling the growth in the global migraine drugs market. Furthermore, development of advanced drugs by the migraine drugs manufacturers is some other factor influencing growth in the market. 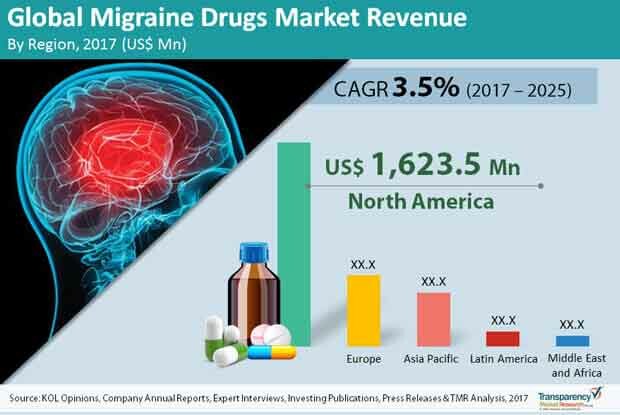 As per the Transparency Market Research, the global migraine drugs market reached a value of US$2.72 bn in 2016 and is expected to reach a value of US$3.72 bn by 2025. The global migraine drugs market is expected to register a steady CAGR 3.50% between 2017 and 2025. The market is mainly segmented into three segments namely Treatment, Route of Administration, and Distribution Channel. From the perspective of treatment, the global migraine drugs market is divided into- Abortive, and Prophylactic segments. Further, Abortive segment is classified into triptans, alkoids, ergot and others based on the drug class. While prophylactic treatment is segmented into botulinum toxin, topiramate and others. Among these treatment segments, abortive procedure is likely to dominant market share in the global migraine drugs market whereas prophylactic treatment segment is projected to register a healthy growth during the forecast period that is from 2017 to 2025. On the basis of route of administration segment, the global migraine drugs market is mainly segmented into oral, injectable and others. The other segment of route of administration includes nasal, spray, transdermal, patches and likewise. Among all of them, orally administrable drugs is likely to holds maximum potential for the global migraine market. And this is projected to continue in the upcoming years as well. This is mainly due to the low cost associated with the usage of oral drugs and vast availability of the oral drugs as compared to the other form across the globe. While on the basis of distribution channel the global migraine drugs market is segmented into hospital pharmacy and retail pharmacy. Based on Geography the global migraine drugs market segment is classified into five prime regions: North America, Asia Pacific, Europe, Latin America, and the Middle East and Africa. Among all these five region, North America is expected to account highest share in the global migraine drugs market during the upcoming years. This is mainly because of the increasing healthcare investment by the private and government bodies. Apart from this, increasing cases of migraine and easy avaiblity of the specialized migraine treatment are the some other headwinds propelling growth in the market. The region is anticipated to register a healthy 3.40% CAGR between 2017 and 2025.